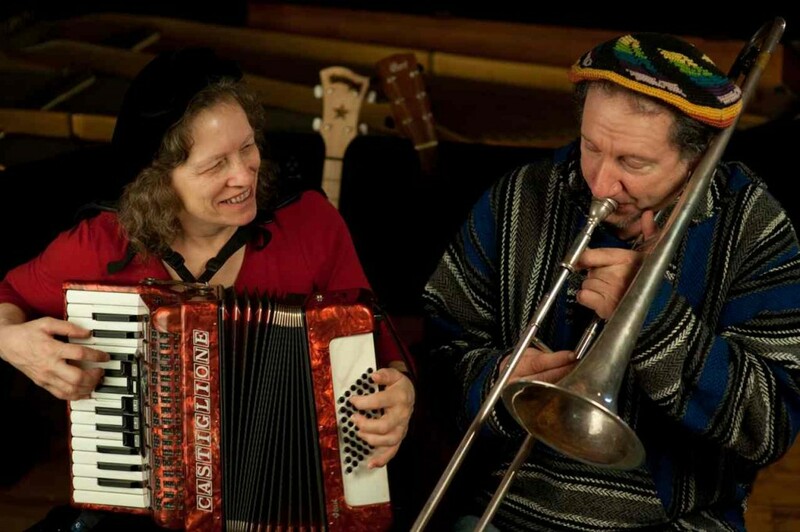 Fred Simmons and Leslie Vogel began playing music together way back when they attended Bard College. Their musical partnership has endured as well as their marriage, and has produced a steady stream of music via various projects, including but not limited to the two main musical groups that go under the heading of Folksoul Music. After years of performance the pair is also enjoying playing together just as a duo, drawing on a large repertoire of material of all kinds, spanning folk, oldies, originals, and songs that might not fit into a band set. 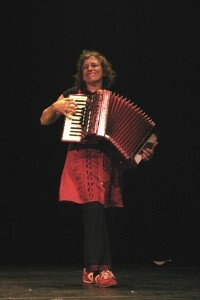 Blending the trombone with piano, and guitar with accordion, there is plenty of variety and plenty of good rhythms. In addition, a new project has recently begun, adding daughter Rebecca on fiddle and vocals, and Dan Wheeler on stand-up bass, and for want of a better name, is being called the Folksoul Ensemble. This gives us the freedom to play songs that don’t require drums, and to play for occasions where a lighter sound is wanted. The Folksoul Ensemble, from a recent live show. 1973—the first band is formed in upstate NY upon my graduation from Bard. Leslie graduates 2 years later. 1976—The band moves to the Bay Area of California (9 of us). We begin learning about street performance on Fisherman’s Wharf in SF, and on the Berkeley University campus, while also playing at clubs and festivals. 1983—we begin traveling up to Alaska to play and explore. We play in all the towns of Southeast Alaska, particularly Ketchikan and Skagway. 1987—A new band is formed, and the process begins again. We make ourselves known at the Folkway Coffeehouse, and I play with Tony Bird, Greg Brown, and begin playing with clarinetist Mad Dog Don Wright. Our bands make music all around the towns. 1993—I make my first trip to New Orleans, playing music with another friend on clarinet, first stopping and playing for the Clinton Inauguration. 2000—I get my wish for a tuba player to play with. Leslie begins a partnership which helps give birth to the Youth Circus Movement, as we play live music for its various incarnations. 2004—we parade throughout the state with Granny D Haddock, to support her run for US Senate, and perform for her, ‘til the day she dies and beyond. 2005—we head down to New Orleans, this time for Mardi Gras season (four of us), to play and take part in the festivities and hear some great music. Hurricane Katrina hits in August. Leslie forms the Youth and Community Fiddle Orchestra as a means of furthering her focus of bringing live acoustic music to events that foster community. 2007—We form the Folksoul Band to play for Mardi Gras at the Union Mill Café.